For a cheap price, this one is hands down the cheapest I've eaten in a mall that's almost a complete meal. Read on. While waiting for an event in Century Park Hotel in Malate, my stomach called out my attention. I'm hungry he says, and it kept at me for almost forever. My brain was calling out for a new place to eat for possible review thus the wait. It's not easy anymore to find such a place in Harrison Plaza considering that most spaces here were taken over by clothing stores, kiosks and bazaars. Along its halls however we found such a food kiosk that grabbed my attention. 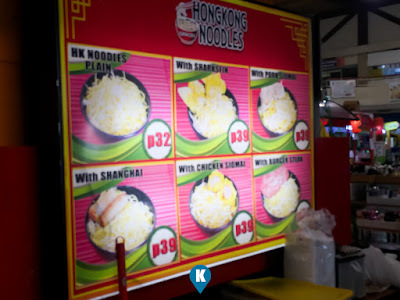 Hongkong noodles in Manila? I've seen one in Star Mall recently and its been flocked by a lot of people. Here it wasn't so I took the leap and dove in. 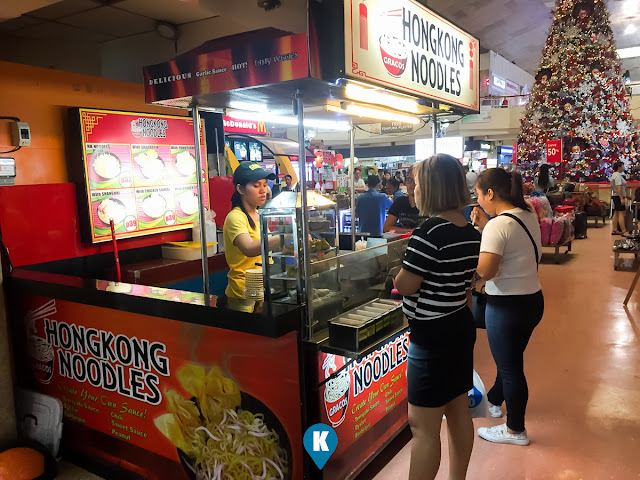 I took the noodles with siomai here and then a lot of diners moved in. Although the increase was imminent, it was no problem as the server was fast in cooking up my order. She simply whipped up a batch and served our order pretty quickly. The noodles were fried on the griddle. Fried? yes fried. My siomai was fried as well to a crisp. 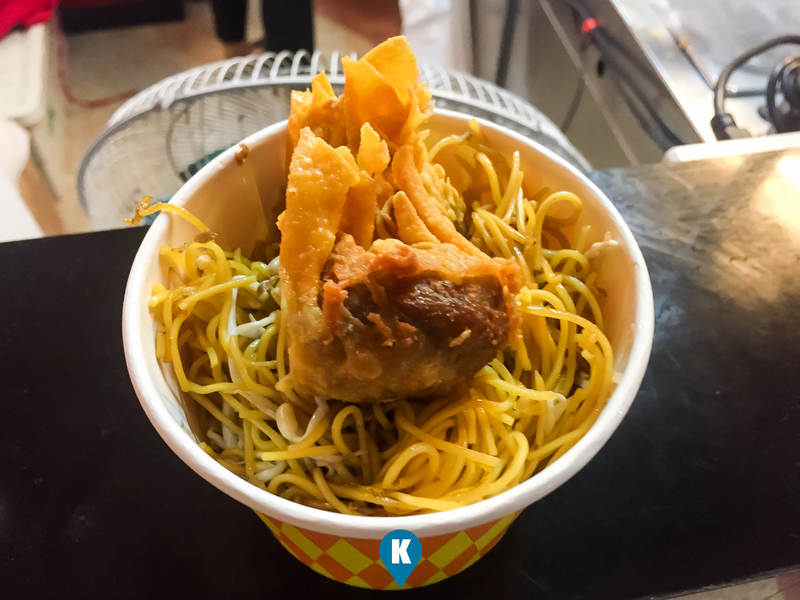 Put in bowl, noodles go in first then topped off with the fried siomai. The whole serving was enough to satisfy a hunger traveller like me, but not full enough to tide me over. Simply it was meant for a quick bite. So don't expect this to replace your usual meal. Taste wise, the idea of fried noodles and siomai is something new to this writer. Finally we got to taste one. We can't say it was great or not as we have yet to taste one for comparison. But for our first experience, all we can say it tasted fried. The oil used for the noodles and siomai must be the same, as they tasted the same. I was looking for a flavor in them but I can't. The noodles were sprinkled with soy sauce so it tasted like soy. Nothing new there and soy doesn't excite me. The siomai maybe the flavor of the dish as I was able to taste a hint of pork (or was it beef) in this. As I said, hint, as the oil overpowered the dish altogether. With all these mentioned, you don't expect it to cost a lot. The cost? Php39. That's than one US dollar and you don't expect much for a dish priced like this one. I think the price reflects the serving size and taste provided. 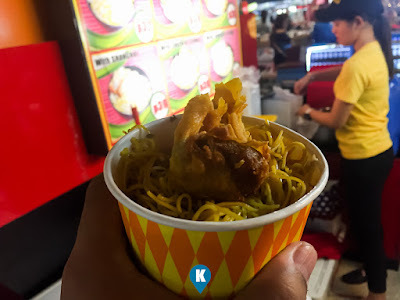 So I you want to grab a quick lunch, merienda or dinner, then this thing is for you. Don't demand a flavorful dining experience here.